Shop for authentic Taiwan Flags. We offer indoor and outdoor Taiwan flags in durable nylon. Our outdoor flags are finished with a canvas heading, while indoor flags are finished with a lined pole hem and your choice of with or without fringe. 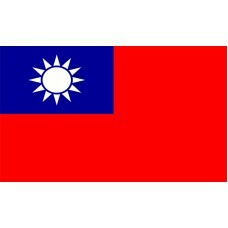 We also offer indoor and outdoor Taiwan flag sets. 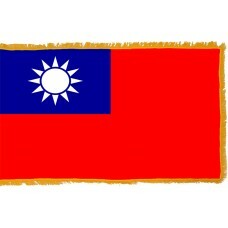 The Taiwan flag features a red field with a navy-blue square in the top left-hand corner and a white sun in the middle of the square that has twelve triangular rays. The Taiwan flag is officially described as the "blue sky, white sun, and a wholly red Earth" and on national day in 1929, the president claimed, "As long as a national flag with blue sky, white sun and a wholly red earth flies on the land of China, it symbolizes the independence and liberty of the descendants of the Huang Emperor." The twelve rays of the sun represent the twelve months and the twelve traditional "Shichen" which is a traditional unit of time that corresponds to two modern hours. The red color represents the blood of those who sacrificed themselves for Taiwan and to overthrow the "Qing Dynasty" as well as representing their livelihood and fraternity, the blue color represents nationalism and freedom, and the white color represents democracy and equality. The Taiwan flag was officially adopted by Taiwan on October 25th, 1945. The first Taiwan flag that was used was in 1663 and featured a white field with the "Zheng" character in the center of it. Taiwan, which is now known as the "Republic of China" is an island that consists of a cluster of islands that were part of China. It is bordered by the South China Sea, East China Sea, and the Philippine Sea. Taiwan is not very recognized as an independent country or separate from China. The capital of Taiwan is called Taipei and the oldest city that was established in 1590 is called T'ai-nan. Taiwan was formerly known as "Formosa." When the Portuguese discovered the island in 1590, they named it "Ilha Formosa" which translates as "beautiful island." Prior to the Portuguese discovering the island, the Chinese referred to Taiwan as "a mudball across the sea, not worthy of China." In the 1700s, the Dutch colonized the islands of Taiwan, until they came under the control of the "Qing Dynasty" which was the last Chinese Dynasty. In 1895, the Japanese invaded and captured the island from the Chinese until WWI, when Taiwan came under the control of the Chinese Nationalists. During WWII, Taiwan briefly came under the rule of the Japanese again. Taiwan is now known as one of the "Four Asian Tigers," (countries that developed into high-income countries through rapid industrialization) along with Singapore, South Korea, and Hong Kong. This is due to all the changes that were made to the public and work sectors during the Japanese rule, prior to and during WWII. Taiwan has become a popular tourist destination with its main attractions being, "The National Chiang Kai-Shek Memorial Hall" that was erected in memory of the former president of Taiwan and is located in the capital, Taipei. The National Palace Museum that is also located in Taipei is home to over 700,000 Chinese artifacts and artworks that represent 8,000 years of history. The beaches of Taiwan are also thought to be the best beaches in Asia, ranging from white and golden sand beaches to black sand and white coral beaches.